All of them base on StAX (Streaming API for XML) but have different set of other useful features. Some of them support asynchronous calls, some of them support more WS-* standards some of them less (is WS-* really what we need? see http://www.tbray.org/talks/php.de.pdf especially slides no. 15 and 16) but which to choose? Maybe you should buy something e.g. IONA Arix? Our team uses XFire at this moment but will have to support also Axis2, maybe XINS. Decision is not easy - if you choose one it can eventually turn out that that features set is not enough or some implementation details break your code, or something is impossible to achieve, or..., etc., etc. Unfortunately it can be too late for you and your project and you will stick somewhere and the only workable solution will be to change open-source code in order to get it worked. Maybe WS frameworks will be mature enough soon but who is able to define soon? Although this const belongs to PublicInterface it is not defined there. It looks like Java bug not Eclipse bug. Why can I access constant from inaccessible interface and cannot import it statically at the same time? It's nonsense - I should be able neither import it statically nor access it through accessible interface. Having known this bug it is possible to expose all methods and constants from inaccessible/package-default interfaces just by extending them by public interfaces. PS. (2008-11-24) This is already fixed - it was a Sun's Java compiler problem (and mine) - everything that is defined in an interface is public (there is no default scope). I don't have much time for reporting this bug to Eclipse bugzilla, so if you have some time please do so (if it is not already reported). This way you get rid of ambiguity. PS. (2008-11-24) It is already fixed - it was indeed an Eclipse compiler bug but don't ask about any dates and versions - I don't have them. 5. Say "%$&*($A@#^*" if I have to repeat this operation many times. I created simple framework in PHP for browsing SQL database and display my pictures (I did it in PHP because I didn't know JSP at that time :) Unfortunately now I am very lazy person and don't want to loose time at home improving this to support DnD (drag'n drop) - but I think I should. It would save my precious time ;) Maybe I will implement such web framework in the future - maybe there is existing one? But how many picture publishing frameworks support GoogleEarth placemarks? Java naming convention is something developers like to talk and argue about ;) Why it is so important? Let's have a look at the following example. Should we use "I"-for-interface convention? The answer is not easy. One can say (I'm among those) that this makes code more readable because you always know whether you are looking at interface or not. It not so important when you have javadoc and IDE (like Eclipse) because you can just press F3 or any other significant shortcut ;) and you see whether it is interface, class, abstract class, enum or whatever else. The readability issue is more confusing when you have to browse repository using web browser. It is really annoying when you enter the class and it turns out to be an interface without content (I mean implementation). On the other hand it shouldn't be the case whether you use interface or the class - in fact in ideal world you should use only interfaces (it's not my thought but I think I can borrow it :). Unfortunately ideal world is only our imagination and it is not so beautiful. I agree that all developers (in OOP) should program to interfaces. For us as users of any API the implementation is not important (it's interchangeable) and we shouldn't worry whether we use interfaces or classes. But there is one thing more which gives "I" prefix advantage over non-"I" convention. If you are a good developer you know that you should use interface and if you see the whole package you can easily choose interfaces and code it. If there is no "I" prefix at the beginning how should you know which class you have to use? Of course it is feasible in reasonable time but it is confusing that first of all you have to dig into the package details in order to find out what is an interface and how should you obtain the implementing object. Some people say that if we decide to use "I" prefix for interfaces we should use the same notation for abstract classes ("A"), enums ("E"), etc. I don't agree - the only instance that does not have any implementation details is interface. Either enums and abstract classes are implemented (if abstract class consist of only abstract methods and attributes it should be an interface). If enums and abstract classes have any contents developers are likely to view them - unlike the interfaces which are not interesting in such context :) BTW: I know that it is rather against Sun's convention but I try to add "Abstract" prefix for abstract classes and "Enum" postfix for enums - note that every exception has "Exception" postfix - but this is ordinary Java class, isn't it?. For me browsing packages is more convenient with such notation. Of course neither of notation mentioned by me is more helpful that puritan Sun's one if we use javadoc. All types are enumerated in categories: interfaces, classes, enums and exceptions. I don't like Sun's policy regarding sharing Java certification information. 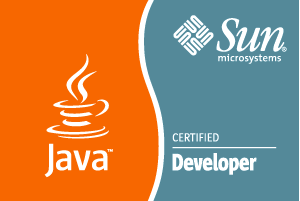 I asked them yesterday whether I can share Sun Certified Java Developer's assignment given to me in order to implement: "I want to ask whether it is legal for me to publish such information (I mean assignment instruction and my solution including source code) on e.g. my public blog? I want to share my knowledge with other people who want to take this exam but I don't want to break the law.". I received response today in which they state: "It is against Sun policy for you or any other candidate to share his or her assignment with others. Sun Certification assignments are considered Sun's intellectual property.". Well I generally understand Sun and I support such policy because I think that everybody who wants to take this exam has to do this by her/himself. On the other hand everyone who takes this exam receives different assignment - why shouldn't I publish my design problem and my solution? This is my first post and I hope not the last one. I really want to write something useful for Java developers (including those from JEE world) and I hope I'll bring some good ideas for them.